Cow horse competition returned to Green Acres Ranch, where the SCRCHA club originally competed years ago. 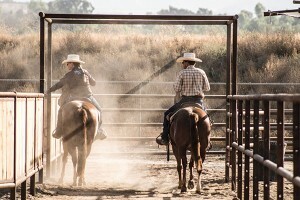 TEMECULA—It had been a while since a reined cow horse show filled Green Acres Ranch. But, after hosting the two-day Southern California Reined Cow Horse Association Big Horse July Jubilee July 13-15, it looks like events will be coming back for a long time. Previous SCRCHA competitions had been held up the road at beautiful Galway Downs, but when facility changes were made for the SCRCHA July show, some members didn’t see the altered arrangement as their best option. Vice President Roy Rich of Green Acres spearheaded an accelerated effort to relocate the club’s summer series to his ranch. It was a sort of return to history, pointed out SCRCHA Vanessa Norris, who said Green Acres actually is where the SCRCHA originated. The new event venue is just one of the SCRCHA innovations this year. The summer series—club shows in July, August and September—is new in 2018. It shifted events into the summer and leaves the fall months available for members to show their horses at a variety of futurities across the region. The SCRCHA summer circuit has its own awards for competitors in SCRCHA classes at all three shows. Divisions include both open and non-pro winners in respective bridle hackamore and two-rein divisions, as well as in non-pro limited. Next up at Green Acres will be the Aug. 9-11 show, which will have another new feature that is expected to be well-received: a Saturday night gathering with a free dinner as its centerpiece. The SCRCHA is offering both ranch riding and ranch trail classes this year, giving another good entry point into participation with the organization.